How do you use Twitter? The Case of BPost (Belgium), Swiss Post, Deutsche Post (Germany) and La Poste (France) - Harold Tor. My doorbell rang this morning, I picked up the parlophone. It was the postwoman: “Harold Tor? Come pick up your parcel I will only wait a moment”. And she arrogantly put the letter back into her bag and handed me a note that she had already written somehow magically (with my name and address on it) that I should collect it from the post office next week. First of all, I thought her to be very rude. I understand that untrained personnel, especially lowly-paid blue collar workers in the service sector, often use their position for an occasional ego trips. She obviously enjoyed her morning. Secondly, clearly she lied that she said it “several times” plus why would she already prepare the written slip already before she knew I didn’t have my ID with me??? We’ve had several brushes with the Belgian Post before. Complaining to the BPost was such a tedious process which I wouldn’t want to get into again. For example, you knew a parcel was arriving but the postman didn’t ring the doorbell because he or she didn’t want to carry it with them. But because it is urgent and you took halfday leave to stay home for it, and they f**ked it up. Upon complaining, they lied they rang the bell but there was no one. So, should I be glad that this one actually rang my doorbell? Via Twitter, I made a remark to the BPost. Very soon afterwards I got the reply: “Onze excuses voor het ongemak. We raden je aan om dit ook even te melden bij onze klantendienst (022 01 23 45). Op deze manier kunnen we dit laten opvolgen in de toekomst.” (Our excuse for the inconvenience. We advise you to submit this to our customer service. In this way we can follow this in the future). I checked their Twitter history and was horrified to see the same message has been cut and pasted (albeit slightly modified) thousands of times. Is Twitter NOT customer service?! I find this symptomatic of large (formerly public) corporations, that their highly-paid managers with decades of experiences do not know how to make full use of social media. They “have” to use it, because the rest of the world is and their shareholders would think they are backward if they don’t. But somehow they are not willing to let go of their gigantic cumbersome “customer service” mechanism slash bureaucracy they have put in place. They probably got a trainee to do the tweeting, who does not have the power to either follow a case or initiate changes on how to make better use of the medium. Over in Switzerland, the Swiss Post seems to have got into a Twitter frenzy. With a more diverse linguistic landscape than tri-lingual Belgium, the Swiss Post has Twitter accounts divided into German, French, Italian and English. The Twitter accounts are even separate for private customers, companies and media contacts. So, 12 accounts in total! As a customer, you are obliged to classify (aka pigeon-hole) yourself before you can tweet to them. Take a look at their tweets. 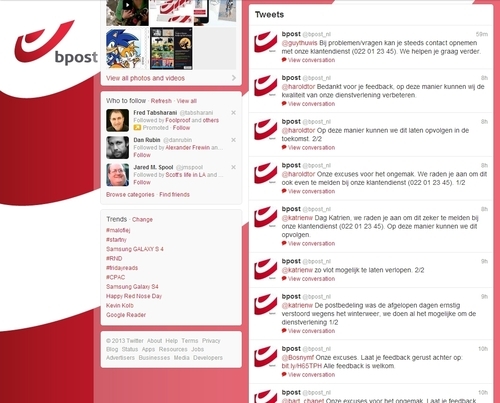 You will find that The Swiss Post uses Twitter to interact in a more congenial way than the Belgian Post does. It markets new products (such as new stamps). It reminds customers of their services (price calculator on their website). It tweets in English (because your own personal language hangups should not affect customers). The Twitterer clearly has the right to follow up on customer complaints and act on it. The customer feels personally attended to, in such a way that a bureaucratic machinery cannot provide. 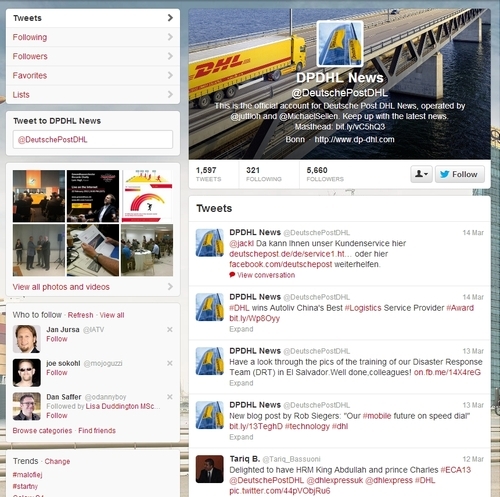 In Germany, the Deutsche Post thinks Twitter is a news outlet and makes no qualms about it. It goes on and on about press releases and their websites etc. It is nothing but a list of links by a chunky faceless corporate machinery. However, the account does credit the staff members behind it: “This is the official account for Deutsche Post DHL News, operated by @juttloh and @MichaelSellen.” So at least you can imagine these two individuals tweeting in a cold dark room all by themselves. 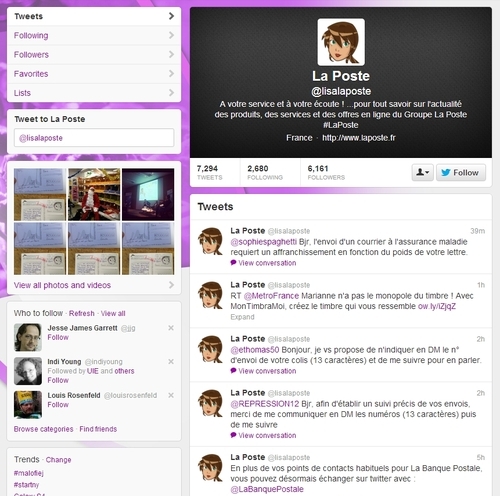 Talking about Twitter personae, this brings us to the last example of La Poste France. It is an account that I feel the people behind it have captured how to use Twitter. 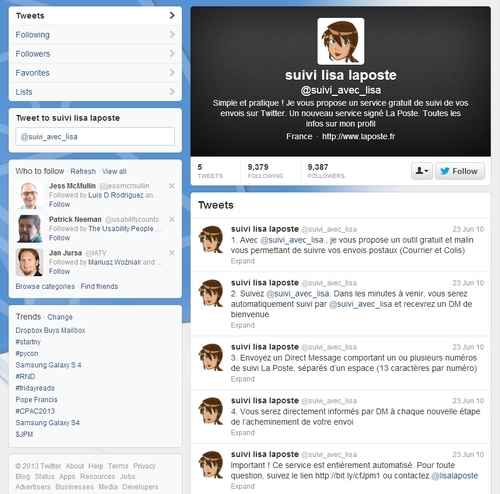 Firstly, they created Lisa the official Twitterer of La Poste. Lisa has her voice, her manner of speech, you can almost hear her speak with a calm friendly voice and see her smile. In fact, Lisa could be an ugly fat man one day and a grumpy old lady the next. The fact of the matter is: La Poste France knew the importance of engaging people who are skilled at tweeting through a personae. It is not about speaking a language, but about speaking a type of language that your customers are familiar and comfortable with. The Twitter handle also makes it clear, that this is not going to be a faceless, emotionless exchange: @lisalaposte Lisa is your friendly La Poste rep! Secondly, the heading of the account says it all: “A votre service et à votre écoute ! …pour tout savoir sur l’actualité des produits, des services et des offres en ligne du Groupe La Poste” (At your service and all ears! To know all about the latest regarding the products, services and online offers of the La Poste Group). La Poste France knows that Twitter IS a channel for customer service: the customer service officer who LISTENS to you and HELPS you with your issue. Belgium’s BPost thinks their Twitter audiences are simply two groups: French-speaking and Dutch-speaking, and they organised their Twitter accounts according. By the same token, Switzerland’s Swiss Post thinks their audiences are individuals, companies and journalists. But the French post seems to know better that their Twitter followers are human beings, who follow them and interact with them to get things done. Why else would I follow the Post Office’s tweets if not to get them work for me?? So Lisa (to continue with the personae) with another Twitter account helps with the tracking of letters and parcels. I find it ingenious! Because parcel tracking (unless when you use a mobile app) means GOING TO the post office’s website. With Twitter, you can have the information tweeted to you! So, I would like to congratulate La Poste France for having grasped the usage of Twitter and made full use of it in their communications, marketing and customer relations! Bravo! *Note: Lisa has 6161 followers (her tracking service has 9387). Deutsche Post has 5660. 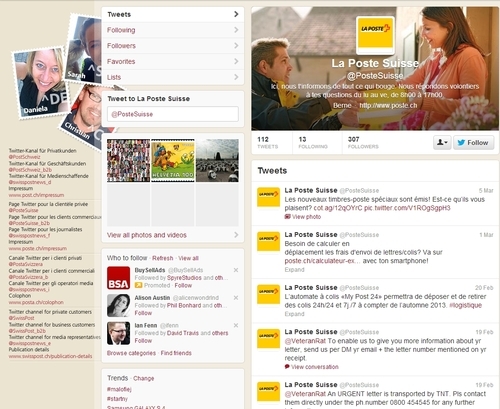 French account of Swiss Post has 307 followers while BPost Dutch account has 1092 followers. Secret of La Poste France’s success? Treat your customers like fellow human beings and tweet with them as such.